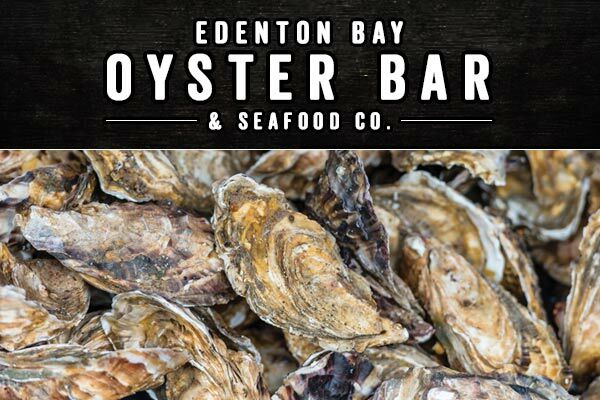 Edenton Bay Oyster Bar, located in Edenton, NC, is where you’ll find classically simple seafood dishes alongside gourmet creations. Edenton Bay Oyster Bar is the sort of place where you can dig into fried shrimp and hushpuppies when you’re craving comfort food or feast on elegant seared sea scallops for when you want to thrill your palate. In addition to their menu items, Edenton Bay Oyster Bar offers gourmet daily features such as classic French Bouillabaisse. The Edenton, NC, restaurant includes a well-equipped steamer bar featuring a rotating supply of oysters, clams and North Carolina shrimp. Oysters are available steamed by the peck or half peck and raw by the dozen or half dozen. The restaurant’s dockside location at Edenton Bay Marina creates a relaxing, romantic or even inspiring setting to match all special occasion dinners, date nights or simply good meals to finish off all fun-filled days. Let waterside views and flavors vie for your attention during your meal, or pair the relaxing setting with a craft cocktail from the full bar. You won’t miss out either way.